Responsive and Adaptive, Image Rotator Magic 2 (IRM2) is an automated Dreamweaver widget that makes it easy to create engaging Image Rotators with compelling animations, usable features, cool effects, and efficient image caching. Add as many Rotators as you want to any page! Fully automated UI in Dreamweaver. Mobile ready, responsive, and adaptive. Includes a max-height option in the event you need to display mixed-orientation images. Easy to use in WordPress and other CMS systems. Optional description—configurable for position and animation method. Description supports HTML markup, allowing you to include simple text, headings, or links. Optional Toolbar with Previous, Next, Pause, and Play icons. Choose which icons appear on your toolbar and select from two positioning options. Optional large Previous/Next arrows displayed at rotator edges. Auto Play options allow you to cycle as many times as you wish through all images. Custom set the delay between images. Set links for each image. External Linking and Bookmark Support. Think about it. In less than a minute, you can build a totally cool image rotator! 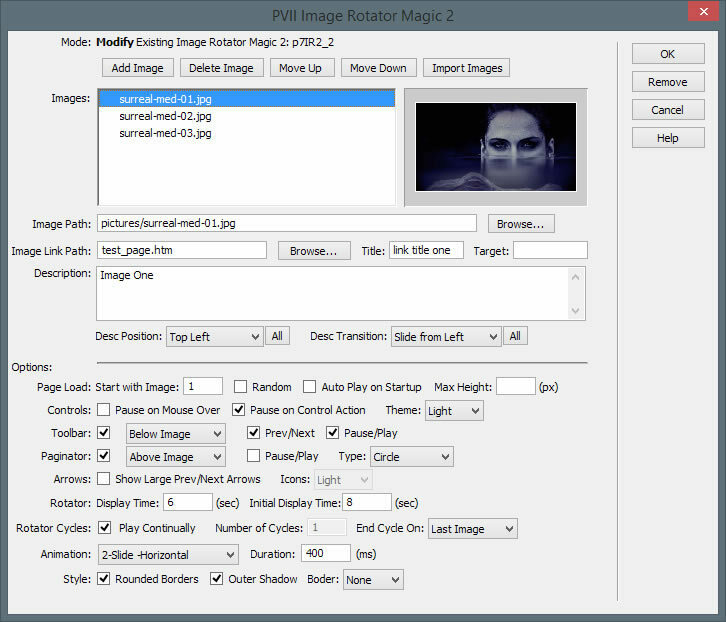 Image Rotator Magic is an indispensable tool that will make your job and your life a lot easier.